Those of you who follow me on Twitter will know that I have been trying to read from my shelves over the past year or so, limiting the acquisition of ‘new’ books in favour of reading older titles from my TBR. 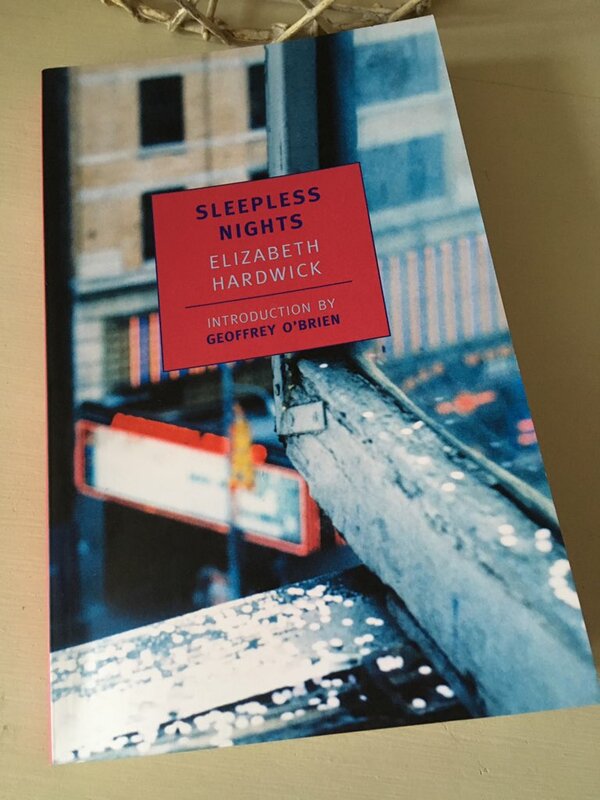 Elizabeth Hardwick’s Sleepless Nights has been sitting there for some time, patiently waiting for its moment in the sun (or maybe I should say ‘the glow of autumn’ as we are in October now). It’s a difficult book to describe – part fiction, part memoir, Sleepless Nights blurs the boundaries between the real and the imaginary. In terms of style and form, the closest comparison I can think of is Renata Adler’s Speedboat, a wonderful book that blew me away with its shimmering vignettes and episodes from the narrator’s life. Like Speedboat, Hardwick’s book doesn’t follow a conventional narrative arc; nor does it possess a noticeable plot as such. Instead, we are presented with a series of fragments from a woman’s life, the recollections of journeys undertaken, of people encountered and situations observed. The writing has a poetic quality, rich with vivid images with the ability to linger in the mind. While at first, the individual fragments may seem somewhat unconnected, there is a sort of framing device at work here. As the narrative opens, a ‘broken old woman’ – also named Elizabeth – living in a shabby nursing home is looking back over the years that have gone before. Over the course of her life, Elizabeth travels from her home in Kentucky to New York, to Boston, to Maine, and then to Europe. Unsurprisingly, there are various relationships with men along the way. We learn of Elizabeth’s first lover at the age of eighteen, a casual, romantic figure twelve years her senior. There are other affairs too, perhaps most notably with Alex, a rather vain man in possession of a certain charm. Following the break-up of a long-term relationship with a different lover, Elizabeth reflects on the nature of their bond – in essence, what it can mean for a man and a woman to be joined together in this way. One of the most evocative sections of the book captures Elizabeth’s memories of her time in New York: the sleazy atmosphere of the Hotel Schuyler where she shared rooms with a friend; the smoky jazz clubs of the city, often characterised by their rapidly changing owners; and the magnetic presence of Billie Holliday, a woman drawn to self-destruction like a moth to a flame. There are other memories too, reflections on Elizabeth’s father and mother, their values and characteristics. Stories of friends, acquaintances and lovers light up the pages, all coming together to form an intriguing collage or scrapbook of the protagonist’s life. In the following passage, Elizabeth recalls her former neighbour, Miss Cramer, an old music teacher who has fallen on hard times. Once elegant and self-assured, Miss Cramer is now a dishevelled and sorry presence in her torn canvas shoes and thin dress – following the death of her elderly mother, the advent of poverty was swift and destructive. The narrative is also laced with a number of perceptions and insights, particularly those on the status of women and their standing relative to men. There are observations on the ease with which society can define a woman by her relationship with a man, almost as if she has little identity or agency of her own. In this fragment, Elizabeth considers the nature of life for spinsters, reflecting that a form of spinsterhood may even exist within marriage – for some women at least. Like Adler’s book, Sleepless Nights was first published in the late 1970s, and its slightly detached tone leaves me wondering whether this was some kind of reflection of the sense of unease in the US at the time. It’s difficult to tell. Nevertheless, there is a fluidity and luminosity to Hardwick’s prose that makes her novel a real pleasure to read. There is a dreamlike quality to the overall feel of the book, akin to the way in which seemingly unconnected fragments or shards of memories seem to emerge from nowhere to flow through the mind. All in all, this is a beautiful, elegant read to stimulate the senses. I’ve posted this review today to coincide with Lizzy’s NYRB Classics fortnight which is running from 1st– 14th October. You can find out more about it via the link. Sleepless Nights is published by NYRB Classics; personal copy. This entry was posted in Book Reviews, Hardwick Elizabeth and tagged #ReadWomen, Book Review, Classics Club, Elizabeth Hardwick, Fiction, Memoir, NYRB Classics, Renata Adler, US on October 2, 2018 by JacquiWine.